Discussion in 'Sportsman's Paradise' started by jvalhenson, Jan 16, 2018. Got one of my best bucks which he might be my biggest ever hard to compare bucks of similar size with different characteristics of mass length width etc. Anyways.....bout 3:45 Saturday was in my usual stand and had some dogs running about 1.5 miles west of me. After a little bit saw a deer coming through the bottom and saw it was a plenty legal buck and got ready. Had a good broadside shot but just as I shot the deer wheeled and really I did not know if I hit him or not. He went in the slough close to me and last I saw him he was running through about knee deep water out of sight. Got down went over to where he was when I shot and followed to where I saw him go in the water but found no sign at all. I was pretty sure I had hit him but with how he wheeled just as the gun went off I really did not know. Finally heard the dogs making their way towards me and knew they were on him so I just got out of their way and let them work. When they got to where I shot him they shut up but stayed on him which usually means they are smelling blood even if you can't see it. They trailed him into the water and I just kind flanked them along the edge of the slough for about 250 yards till they came out of the slough, across a narrow strip of dry ground into a deep ditch. When I got up to that narrow strip of dry ground there was blood everywhere so knew then I hit him. Waded across the ditch and stayed on blood on the other side. Bout that time I started hearing the dogs baying him so I broke off the blood trail and ran to them. Got there and they had him on the ground. He was just laying there barely moving and I started to shoot him in the neck but stupidly decided no I might get him mounted and he is almost dead anyways so I will just put one behind his shoulder through the lungs and he will just die right here not like he is going to get up. Well I put the barrel of the 7mm BAR right up on him and shot. Before that spent casing hit the ground that sucker was his feet and on me. It was incredible how fast he got up. 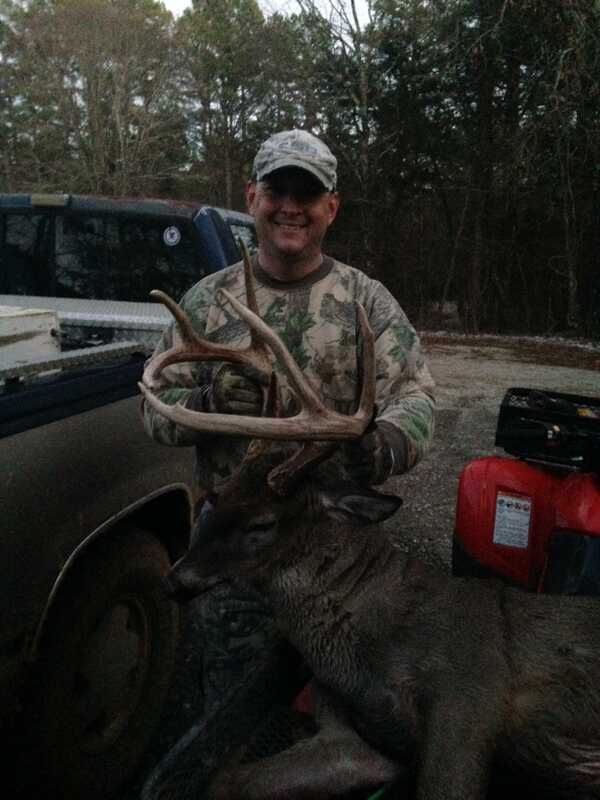 Somehow I reacted fast enough to grab his horns with my left hand and still had rifle in right hand and was able to hold him off me as he was backing me up. 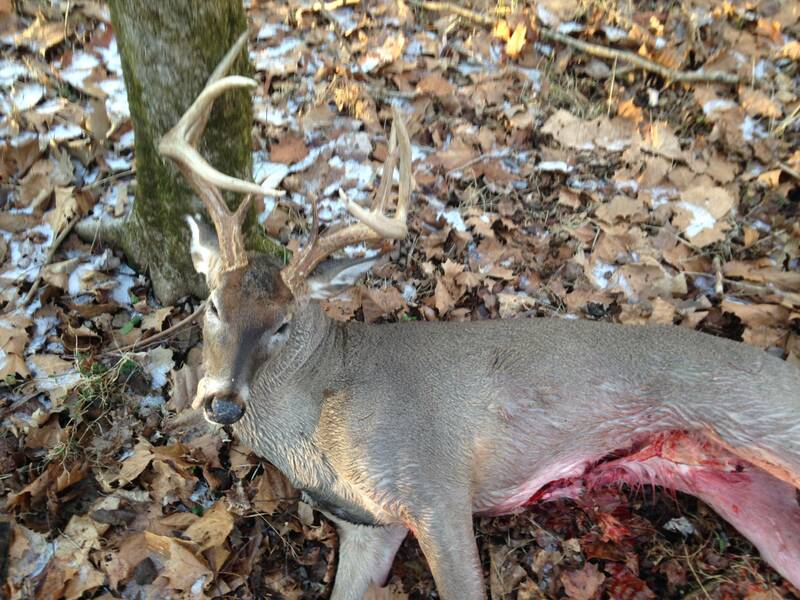 Got him turned sideways again and under enough control to get gun back on him and put one more in him. Still didnt go down he just kinda flinched hard and stared at me. After about 10 seconds of a stare down he finally started to wobble and fell over. He had gone 700 yards in an arc from where I shot him and bullet had somehow gone in through the back of the lower part of the hind quarter and blew out the bottom of his gut. terrible shot but was "lucky" that I hit him as good as I did with how he wheeled. Not overly wide at 15.5 inches but beams are 28.5 and 30 inches. 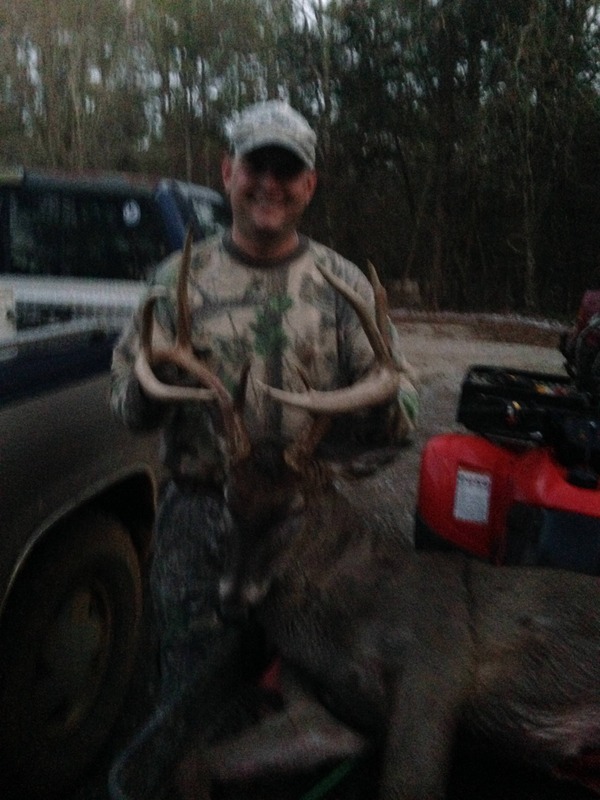 Tines over 10 inches long. 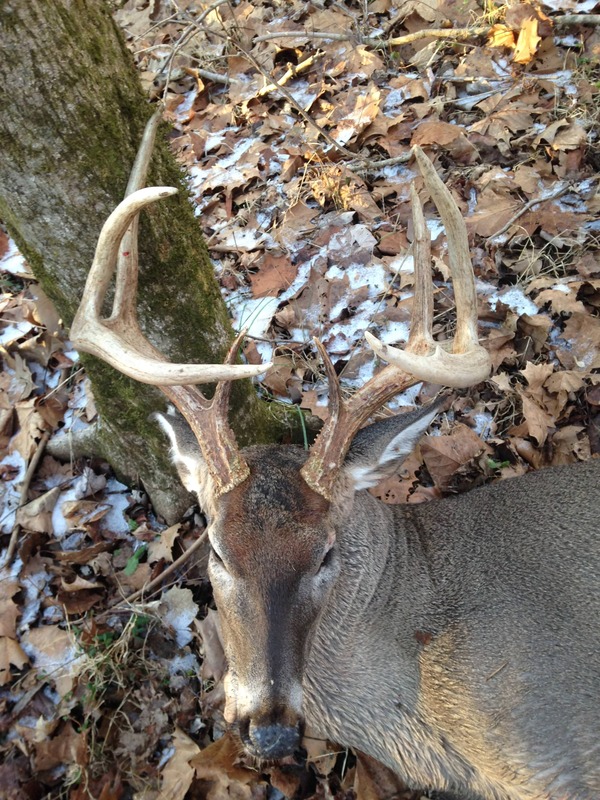 Main frame 8 point with 2 smaller but legal sticker points making him a 10. Lots of mass and carries it throughout. Oh and it was all in the snow too so he is also my first "snow buck" ever which is one of those things I have always wanted to do. Pic doesnt look like it but there was a lot of snow on the ground. tigerbait3, KyleK, Bayou Tiger and 1 other person like this. Did the guys running dogs get pissed? Nah they all buddies of mine they knew it was me when I shot. 99% of dog hunters don't care who kills a deer they thrilled that anyone whether they know em or not kills one in front of their dogs. Most kill plenty of their own deer so don't want any of the meat either. Yeah that's true. Most people who hunt anythinnwith dogs enjoy seeing their dogs work more than anything else. Put a tape on him Friday night. We were very tight with the tape made sure score was legit and I was surprised how much he scored being only 8 of the points are "scorable." Came out to 148 3/4s. Def my biggest. Killed some wider but his mass tine length and beams more than make up for the spread. I don't know how to score em but definitely a nice deer. Congrats. Not hard. Measure inside spread, beam length, and each tine length. Then take 4 mass measurements on each beam at the base, then between each point(they all get 4 mass measurements on each beam regardless of number of points) then just add all those measurements together to get the gross score. If you want to follow full B and C rules then you take the difference in the 2 sides and subtract that to get the net score which I don't like. To me whatever horn he grows is what he is the deductions nonsense is stupid. This would have 5 inches of deductions so net score would be 143 3/4s. No thanks. I'll just stick to the easy stuff like rocket science. ha i guess it complicated then.....dont really think using a ruler and adding a few numbers together is overly difficult but I'm just a hillbilly dont know much.